35 Ye shall do no unrighteousness in judgment, in meteryard, in weight, or in measure. 36 Just balances, just weights, a just ephah and a just hin, shall ye have: I am the Lord your God, which brought you out of the land of Egypt. It has come to My attention, messenger and servant Jacob, that hatred abounds all over this world today. It has come up in My remembrance and My memory time and time again recently, that many of the people who say they love Me in My so-called churches of today, secretly hate the new house of Israel who I delight in at this time. In fact their hatred of My house of Israel runs deep, wide, and evil in their hearts and minds right now. This hatred abounds in them also towards the people of any other race or color who they think does not measure up to their standards of excellence, quality, wealth, status, or prominence. I, the Lord God know this hatred towards others and towards My Hebrew people in My new house of Israel, is visible in many of My so-called churches of today. It is visible in a great portion of the wicked people in these churches who say they now belong to Me and My Son, Jesus. It is also visible in their allies, in their friends, and in their secret meetings and writings. It is visible in their closed and sanctioned family lifestyles, and in their self-centered and vain speeches of today. It is visible also in their children's behavior, who they never reprimand for feeling this way. Therefore, let it be known to these wicked people in My so called churches of today, servant and messenger Jacob, that I, the Lord God, am against the hatred these people are now displaying to others. I Am also against the hatred that remains in their hearts and minds toward My Hebrew people, and to others. 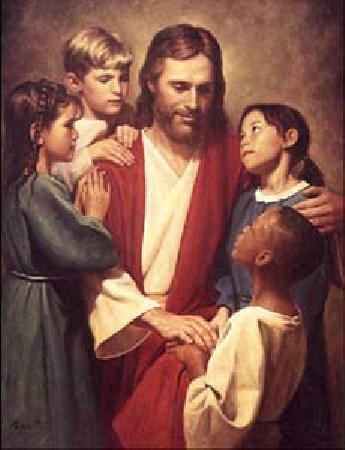 For I Am against any people who hate others because of the color of their skin. I Am against anyone who does not respect, but puts down the widows, the orphans, the lame, the diseased, and the afflicted and people of this world. For many of them are the apple of My eye, just like My Hebrew people of old have always been the apple of My eye. I, the Lord God, am against anyone who does not love My newly formed house of Israel today. I will soon tear many of these rejects down and destroy them if they do not want to support My new house of Israel in their fight against all of their enemies. Therefore, many wicked people today will not be allowed to come into My kingdom, or into My presence, in the coming years. For the hatred that I, the Lord God, can see in their hearts and minds today has now tarnished and polluted their souls. It tells Me that their father is now the Devil of darkness and the perpetrator of evil. This hatred in many wicked people today shows Me they will not be worthy to be a part of My new pasture of unified sheep. Therefore, I, the Lord God, will not be taking these people in, for they do not desire to honor My words of yesterday or today. They do not at this time belong to either Me or My Son, Jesus. For if these wicked people can hate My original Israel rooting tree of life, then I know they have hatred inside of them for My only Son, Jesus. Therefore, they will continue to remain vile and corrupt in My eyes. I know the darkness in their souls will continue to blind them to the truth and the wealth that I, the Lord God, have given them, and given to this world in these last days. It will blind them to the fact that they are not now under My tents, or within My courts of honor. For it is a known fact in heaven that the kingdom that I alone own will only be given to the innocent and humble people of this world who I admire. It will only be given to the humble sheep in the fields who are willing to follow Me with obedience and faith in their hearts, minds, and souls. It will only be given to the people who willingly want to obey My commandments, and want to honor My desires at all times. It will only be given to the sheep who are respectful, obedient, and considerate of all the mingled people who are around them today. My kingdom will only be given to the people who are hospitable and respectful to the strangers who are near them now. For all of the creatures upon this earth were fashioned, formulated, and created by Me. Therefore, true love, peace, grace, and mercy can only be found within Me and My Son, Jesus. Therefore, I, the Lord God, will not allow any place for hatred to be seen in My sheepfold, or in My camp, in the coming days. I will only allow love, charity, and respect for others to be seen in My new and glorious gardens, and in My new promised land. For if anyone ever wants to see Me and abide with Me in My bosom in the not too distant future, servant Jacob, they will have to repent to Me of their evil works and their sinful deeds. They will have to erase any hatred or unforgiveness they have for others. They will have to completely erase this hatred and unforgiveness from their hearts, their minds, their souls, and their memories if I Am going to even think about taking them in. They will also have to ask Me for My forgiveness and repent of their evil ways if I Am even going to even think about taking them into My new promised land and sheepfold.